The St. Mary's County Department of Public Works and Transportation reports it has run out of mulch. It is expected another grinding will occur in about two weeks. New supplies of mulch should be available by the end of May or beginning of June. ACTION REQUESTED: Review of a Concept Site Plan for three buildings totaling 85,551 square feet to be used for Research and Development Service. This public hearing is required by law to allow the applicant and all interested parties the opportunity to present evidence and public comment regarding this proposal. A decision will be made solely on evidence and testimony presented during the public hearing. Information submitted after the public hearing record is closed will not be considered. The file on this application is available for review in the Department of Land Use and Growth Management, 23150 Leonard Hall Drive, Leonardtown, MD until 2:00 p.m. the day of the meeting. If you have any questions regarding this application, please contact Development Services Division at the Department of Land Use and Growth Management, 23150 Leonard Hall Drive, Leonardtown, MD or at (301) 475-4200, ext. *1506. The Commissioners of St. Mary's County invite the public to a groundbreaking ceremony for the new Leonardtown Library and Garvey Senior Activity Center on Tuesday, May 15, at 9 a.m. The ceremony will kick off construction of the long planned replacement for the Leonardtown Library and Garvey Senior Activity Center. The combined $19.9 million, 45,507 Square Foot facility will include additional public library space, reader/computer seating, computer training room and quiet rooms for library patrons. Those using the new Garvey Senior Activity Center will enjoy upgraded strength training, increased space for aerobic exercise-type activities, an enlarged dining area and pickle ball courts. "The Commissioners of St. Mary's County are extremely pleased to get this long-awaited project off the ground," said Commissioner President Randy Guy. "We are appreciative of the continued efforts of Garvey Senior Activity Center Council, Inc. and Friends of the Library. Without them we would not have arrived at the point of breaking ground on this new facility." Those wishing to attend are asked to park near the Potomac Building, located at 23115 Leonard Hall Drive at the Governmental Center in Leonardtown. Shuttle service will be available to the build site off Leonard's Grant Parkway. Shuttles will be available from 8—9 a.m. with return service available between 10:30 and 11:30 a.m. Parking will not be available at the build site. 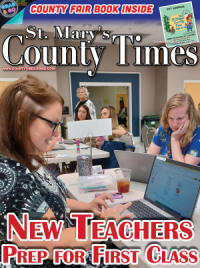 "The new Leonardtown Library will be spacious, light, and beautiful," said Michael Blackwell, Director of St. Mary's County Library. "We look forward to celebrating the groundbreaking of this great enhancement to library service in our county." "The new Garvey Senior Activity Center will be a place to enjoy many kinds of activities, including exercise classes, crafts, painting, and pickleball," said Lori Jennings-Harris, Director of the Department of Aging & Human Services. "We will also have a state of the art kitchen facility and room to accommodate at least 100 guests in the dining area. We are excited about the groundbreaking, of the things to come and collaboration with the library!" Space for the event is limited. Please RSVP to Sarah Miller at sarah.miller@stmarysmd.com or call 301-475-4200, ext. *1073. Seating and bottled water will be available. Immediately following the groundbreaking ceremony, guests can join Grimm & Parker, architects for the project, at the Leonardtown Library for a 3D tour of the new Library and Senior Activity Center. The Maryland Department of Agriculture (MDA) will sponsor a summer collection program for empty plastic (HDPE) pesticide containers according to specific guidelines. The nearest location to St. Mary's County which accepts out-of–county pesticide containers will be the Frederick County Landfill, 9031 Reich's Ford Road in Frederick, MD. Collection dates are June 19, July 24, August 21 and September 18, 2018 between the hours of 9 a.m. and 3 p.m.
news.maryland.gov/mda/press-release/2017/05/08/maryland-recycles-pesticide-containers-for-25th-year-collection-dates-open-in-june/. The pesticide containers will be chipped and transported to an approved recycling facility for processing. For more information about recycling in St. Mary's County, please contact the Department of Public Works and Transportation Recycling Program at 301-475-4200, or log on to www.stmarysmd.com. The St. Mary's County Board of Elections continues to seek individuals willing to serve as Election Judges for the June 26 Primary Election and the November 6 General Election. 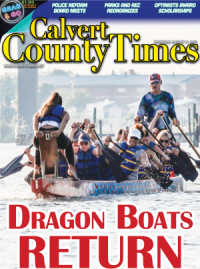 Judges are most needed in Northern St. Mary's County and the Mechanicsville area. Poll locations at White Marsh Elementary School, Christ Church and Lettie Dent Elementary School have a critical shortage of Election Judges signed up. WHAT DOES AN ELECTION JUDGE DO? : In accordance with Federal and State law, you must perform all of the duties assigned to you by the Local Board of Elections and perform your duties faithfully, diligently and without partiality or prejudice. ELECTION JUDGE PAY: Judges receive $150 per election as well as 30.00 for attending the required training class. If you do not work the Election, you will not get paid for attending the training class. Judges receive payment from the county within 6 weeks of the election. The meeting will now take place on Thursday, May 17, at 1 p.m. in the commissioners meeting room inside the Chesapeake Building in Leonardtown. The Tri-County Animal Shelter after hours drop-off kennel and cage area is closed to the public. The Maryland Department of Agriculture's State Board of Veterinary Medical Examiners recently revised the minimum standards of care for animals in Maryland animal shelters. To comply with these standards, the public is asked not to use these facilities. Animals will be accepted in the main lobby area of the Tri-County Animal Shelter, Monday through Friday from 10 a.m. until 5:30 p.m. and Saturdays from 8 a.m. until 3:30 p.m. The Tri-County Animal Shelter is located at 6707 Animal Shelter Road in Hughesville. Shelter staff can be reached at 301-932-1713 or 800-903-1992. Adoption hours are Monday—Friday, noon to 5 p.m. and Saturday, 10 a.m. to 3 p.m.
NOTICE IS HEREBY GIVEN that the Commissioners of St. Mary's County will hold a Public Hearing on Tuesday, May 15, 2018, beginning at 11:00 a.m. in the Chesapeake Building located at 41770 Baldridge Street in Leonardtown, Maryland to consider an amendment to Ordinance No. 2017—15 to provide exemptions to the development impact fee for replacement dwelling units under certain conditions. Copies of the proposed amendment are available in the Department of Land Use and Growth Management, 23150 Leonard Hall Drive Leonardtown, MD 20650 and at www.stmarysmd.com. Written comments may be submitted on or before May 22, 2018, to: Commissioners of St. Mary's County, P.O. Box 653, Leonardtown, MD 20650. Any reasonable accommodation for persons with disabilities should be requested by contacting the St. Mary's County Public Information Officer at (301) 475-4200, ext. *1342. Note that as a result of the evidence and comments made at the public hearing, amendments may be made to the proposed maps. The St. Mary's County Commission on Aging has changed the date of its next meeting from Monday, May 28 to Monday, May 21. The meeting will be held at 1 p.m. at the Garvey Senior Activity Center. For more information, please contact Debra Kane at 301-475-4200, ext. *1680, or email Debra.Kane@stmarysmd.com. Additional information about the Commission on Aging can be found at www.stmarysmd.com/voluntr/.